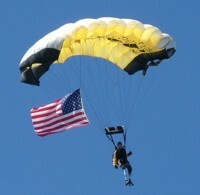 He’s a skydiver, a retired member of the U.S. Army’s Special Forces and The Golden Knights. He’s also a double amputee and the first double amputee to qualify for re-qualify for active duty. Dana Bowman does it all! He helps those who hear his story believe; believe that miracles do happen, believe that hard work and perseverance reap rewards, believe that we all can make a difference and most importantly, believe that we all should. In February 1994, while performing a routine training exercise over Yuma, Ariz., as a member of the Army’s elite Golden Knights parachute team, Bowman’s life as he knew it was instantly altered. While performing a maneuver known as the diamond track where the team forms a human diamond in midair, Bowman and a teammate collided at a combined speed of 300 mph. Bowman’s left leg was severed below-the-knee; his right leg above-the-knee. His teammate died instantly. For some unknown reason, Bowman’s parachute opened and he landed unconscious in a parking lot. Lunging into a punishing program of rehabilitation, he wore out four pairs of prostheses in six weeks. "I absolutely had my own personal deadlines,'' he said. It typically takes a double amputee several weeks to get rid of crutches and canes, but Bowman was walking again in three days. 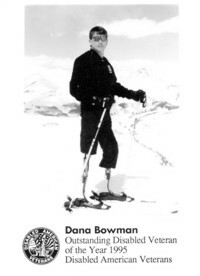 Bowman insisted on helping doctors design special prosthetics that allowed him to water ski, snow ski, scuba dive, and bicycle and lead a full, active life. He went to the hospital’s brace and limb shop at night and built his own sockets, which join the remaining leg to the prosthesis. “I didn’t have all my life to wait for equipment,” he said. Five months after the accident he left Walter Reed hospital to go skydiving as a part of a Golden Knights wedding ceremony. As his strength grew, so did his reputation as a cheerleader for other wounded soldiers. "He was just a real spark plug,'' says Army Under Secretary Joe Reeder, who visited Bowman in the hospital. "His accident would have brought most people down." Nine months after his accident, through much practice and perseverance, Bowman became the first double amputee to reenlist in the Army. Subsequently, he became the U.S. parachute team’s lead speaker and recruiting commander. During his 20 years in the US Army, Bowman’s many activities and honors in the military included being awarded a bronze star for valor in 1989 during the conflict in Panama. He served in the Grenada invasion and speaks fluent Spanish. He also served as a Special Forces soldier, sniper and combat diver. In 1995, Bowman was honored as Veteran of the Year. In 1996, he made his last jump as a Golden Knight into the opening ceremonies of the Paralympic Games in Atlanta. He retired shortly thereafter. In 2000, he became the first member of his family to earn a college degree and graduated with honors, earning his bachelors’ degree in commercial aviation. 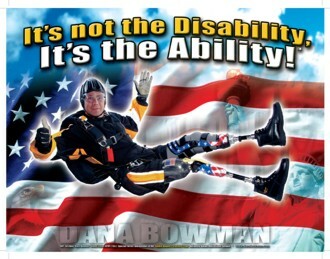 Presently, Bowman is the only double amputee commercial helicopter instructor pilot in the world, as well as a commercial hot air balloon pilot. Additionally, Bowman visits military hospitals every month to provide support to soldiers who have been injured in the Iraq and Afghanistan wars. “I get the opportunity to show the young soldiers what they can do with their lives after a tragedy,” said Bowman. “It is all about attitude,” Bowman said. “I tell the soldiers my story, listen to theirs and give them hope.” He is a certified peer visitor for the Amputee Coalition of America.